After defying the odds in Game 1 and handing Chicago its first home loss since March 28, the Atlanta Hawks are preparing for what they know is certain to come—a resilient effort from the top-seeded Bulls in Game 2. Joe Johnson, who led the Hawks in Game 1 with 34 points on 12-of-18 shooting, including five-of-five from behind the arc, agreed. Prior to the Hawks’ shootaround at the United Center Wednesday morning, Johnson discussed the team’s minset after stealing home-court advantage in the best-of-seven series. “We were hungry, knowing that fact that in order to advance, we had to get a game on their court,” said Johnson of Game 1, in which Atlanta jumped out to a 10-point lead at the end of one quarter. “Now that we’ve done that, we can’t be satisfied. We’ve got to keep pushing and move forward. We’ve got to try and be greedy. Horford also stressed the importance of another quick start to help eliminate the crowd. It’s a position the Hawks have been in before, as in the opening round of the playoffs, they claimed Game 1 on the road against the Orlando Magic with a 103-93 victory. The next game was another story. Hawks coach Larry Drew discussed how a degree of complacency may have set in that resulted in a Game 2 defeat at the hands of the Magic, but he’s out to ensure that does not happen again. “We did not come out with a sense of urgency in Game 2 in Orlando after we had won Game 1,” said Drew. “We had a lot of slippage in that area and I take full responsibility for that trying to get this team ready, not just physically, but mentally. At this stage, you can never be satisfied. While Drew and the Hawks insist they won’t be satisfied with securing just one win in Chicago, he is realistic about the focus in which he expects the Bulls to display. If the Bulls are to even up the series, a big effort from Derrick Rose may be necessary. Rose, who will be recognized as the league MVP by NBA commission David Stern prior to Game 2’s tipoff, finished with 24 points and 10 assists in Game 1, but shot only 11-of-27 from the field. With a strained hamstring keeping starter Kirk Hinrich out of the action, rarely used Jeff Teague was given the assignment of matching up with Rose at point guard. Teague held his own, recording 10 points and five assists in 44 minutes of action. 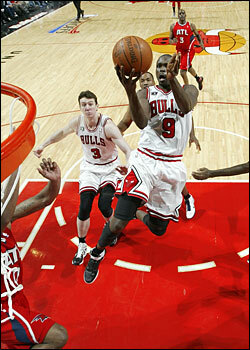 Teague also contributed to a defensive effort that didn’t allow Rose to get to the free throw line once. Not surprisingly, Drew offered no complaints about the Game 1 officiating and credited his team for containing Rose. He acknowledged keeping Rose off the line was a priority, and challenged his defense to eliminate the gaps and seems to stop dribble penetration, thus preventing Rose from entering the paint.